Check out this stock replica of SpaceX's Falcon Heavy. This is a very powerful launch system capable of sending a very heavy payload and second stage into LKO. The 3 falcon 9s are also able to return to Kerbin and land. Fuel usage on the bottom tanks has been disabled to warn you that you are running low on propellant. At this point the last fuel reserves should be activated and the falcon 9s returned. The whole assembly is designed to get into orbit before the boosters separate this way they can be parked in orbit and deorbited one by one. 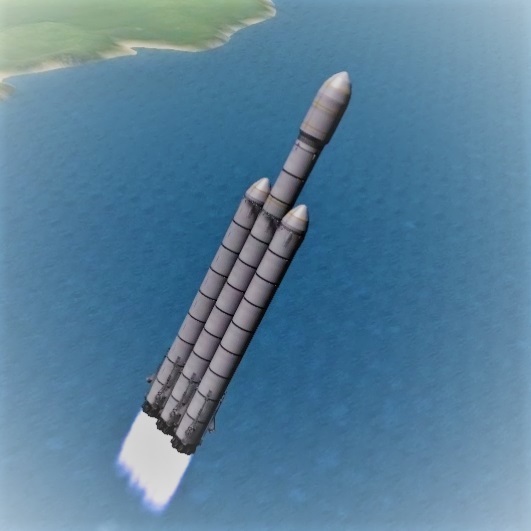 Unlike my other craft files this one has no payload so you are encouraged to launch what ever you like. No payload is required if you just enjoy trying to land the boosters. I have also included a Falcon 9 in the zip file. Thanks to Giuliano Tulerman for creating these wonderful stock legs. Be warned: Because they become separate craft and rejoin they reset thrust. Holding L-Shift or taping z is advised until they are locked in place.